Coherence relations play a crucial role in text understanding. This has long been recognized in both text linguistics and discourse processing. The experimental research reported in this dissertation focuses on the cognitive processes and representations involved in the understanding of causal coherence relation in non­narrative text. The research confirms the basic claim in text linguistic theories that causal coherence relations are part of the meaning representation readers construct on the basis of the text. More specifically, the research shows that causal coherence relations are represented at the level of the situation model. Three major results constribute to this conclusion. First, the presence of connectives influences an inferential process that is involved in the construction of the situation model. Second, for explicit causal relations (marked with a connective) a recognition experiment provides evidence for a situational representation of causal relations, but not for other levels of representation. Third, experimental results indicate that readers’ knowledge of text structure enables them to form text structural expectations that guide the interpretation of text in a top­down manner. For these reasons, understanding causal coherence relations can be characterized as a process in which the reader integrates explicit text and background knowledge to form a situational representation of the relation. 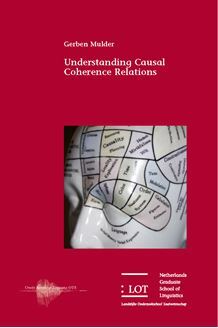 This dissertation provides insight in the psychological status of causal coherence relations. The research combines ideas from text linguistics and discourse processing. It should therefore be of interest to researchers working in either of these fields.